When New Horizons launched in early 2006, it was on its way to visit Pluto, the most distant planet in our solar system. Later that same year, Pluto was demoted to dwarf planet status. And yet New Horizons continued on its mission of science and discovery. Uplogix doesn't care much about labels either. Since we manage devices over the console port, it's possible to pull information from just about any device. Sure we have lots of pre-written rules for big name brands like Cisco, HP and Juniper, but at the basic level of communication over the console, we can provide real value when it comes to managing a remote device. Traveling at the speed of light, it takes about four and a half hours for data to travel from the neighborhood of Pluto to Earth. And even then it's not much of a data pipe: just 600 to 1,200 bits per second, or about 50 to 100 times slower than the speed of a modern cable modem. New Horizons has pre-set instructions and automated responses that allow it to work on its own without relying on direct instructions from ground control. There are a few reasons we say Uplogix is network automation you can implement with confidence. First, the automation is your run book. What would YOU do in a given situation? Uplogix will take those same steps. Every time. No skipping steps like people are prone to do. And these aren't just knee-jerk responses. Service level validation adds qualitative data for decision making, as well as the ability to trend over periods of time before taking an action. Finally, with out-of-band access, you can always get to your gear. With our Iridium modem, that gear can be anywhere on Earth. As of this writing, Uplogix is still confined to terrestrial operations. There is a radioisotope thermal generator on New Horizons. That's a nuclear power source that converts heat from naturally decaying plutonium into electricity. 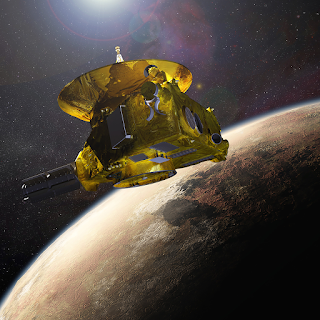 The mission is so far away from the sun that New Horizons needed a power solution that didn't rely on solar power. Uplogix doesn't pack nuclear power (just plain old AC or DC), but onboard processing and storage, coupled with local connections to managed devices enables some pretty powerful automation. Our default polling interval is 30 seconds and we have a file system with enough storage to save more than two dozen versions of both startup and running configurations as well as OS for each managed device. And, if it's something you are concerned about, we do have drives available with 256-bit AES compliant data encryption.